This is a very lovely tablecloth. It is printed linen. The background is pink and there are large bouquets of turquoise, blue and white flowers. There is a dark purple border with tiny flowers running inside the border. The colors are so cheerful - definitely a vintage color palate, and not what you normally see. Fun! This tablecloth measures 50 x 64 inches. It is in very good, but not quite excellent as found condition. 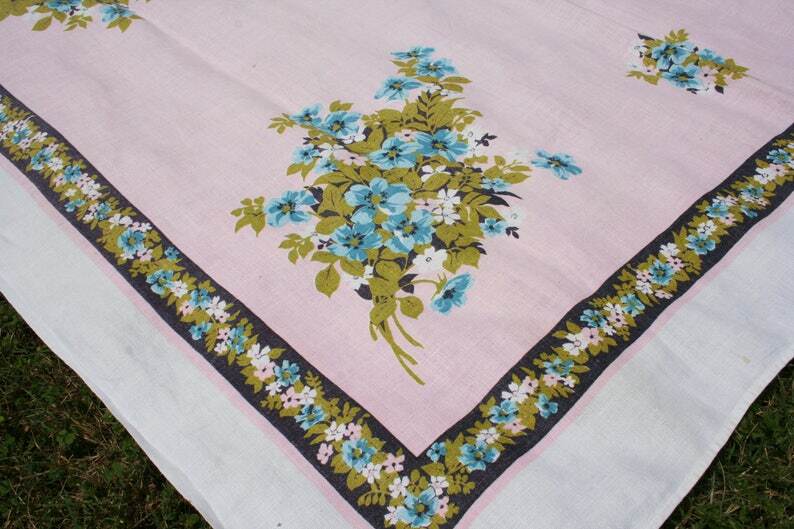 The tablecloth has a few pale spots which is typical for stored vintage linens. A good soak should lighten them right up. See last photo.